April is National Poetry Month, and what better time is there to teach and explore poetry with your students?!?! I love to spend the month of April having students read, write, and share poetry in our classroom. At the beginning of my poetry units each year, I find that my students are often intimidated by poetry, especially when it comes to writing it. Over the years I have tried to find the perfect activities to ease them into writing their own poems. One of my favorite activities is taking my students on a Haiku Hike!! Several years ago I found this book, Haiku Hike from Scholastic. The story and poems in this book were written by a class of 4th grade students. 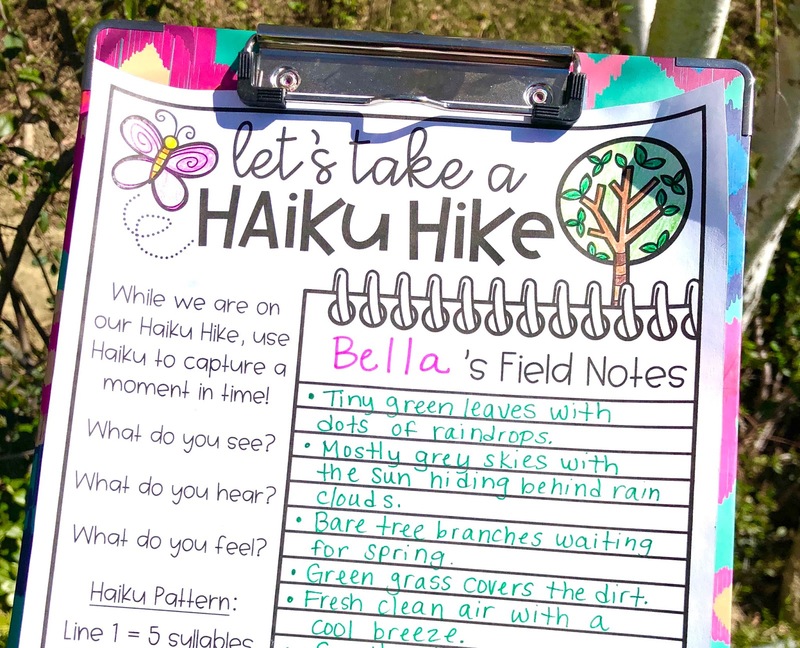 The idea behind the book is that the students in this class went on a nature walk, and instead of taking pictures of the different things they saw, they used the form of haiku to capture different moments and scenes in nature. I loved this idea so much that I decided to implement it in my own classroom. I would suggest creating an anchor chart to discuss and display the elements of Haiku. Once your students are familiar with Haiku, they are ready for their Haiku Hike. You could schedule a hike or nature walk as a mini field trip, but I simply take my students on a walk around the grounds of our school. Students take “field notes” throughout the hike. I ask them to take notes about what they see, hear, and feel, and encourage them to be as descriptive as possible. I also ask them to try to capture a moment in time or a scene in nature. Below is a page you can provide for students to record their field notes. Click HERE to download this FREEBIE!! Once you return from your hike, it is time for students to turn their field notes into haiku. Ask them to write two to three poems based on their experiences and observations. They can write these drafts in a writer’s notebook or journal. Have students share their poems with you and their classmates for feedback. Then have them choose a final haiku to publish. Since students are using haiku to “capture” a scene or moment in time, you can have them use the Polaroid page below to record and illustrate their haiku. This page is also included in the free download!! These “snapshots” make a beautiful bulletin board for students to display their haiku!! This activity is the perfect way to ease students into writing their own haiku. It gets them outside to observe their environment. What better way to inspire nature themed poems, than going outdoors to explore?!?! 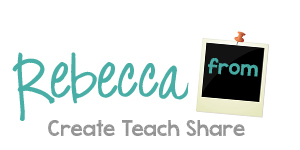 If you are looking for more poetry activities, check out this blog post on my blog, Create Teach Share. 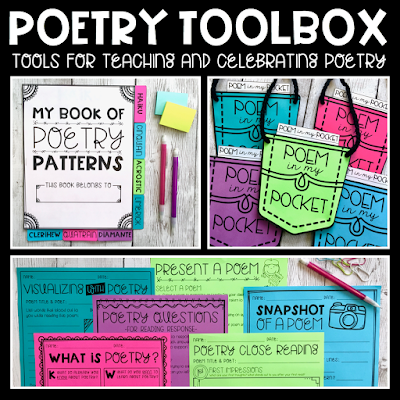 You can also check out my Poetry Toolbox in my Teacher Shop! !